In the middle of rehabbing an ACL tear myself at the moment. Definitely understand the mental side of it. Very interesting to see just how well pro's are looked after though. The amount of physio and S&C support he has is incredible. This is in comparison of course to my situation, senior club rugby. Great video though and definitely gave me a little kick up the hole when I needed it!! Good luck with the rehab. Until you are there you would never realise the impact of an injury like that. That's incredibly cruel on the guy. Thanks for everything Ronan, lots of great memories for us and I hope that it's the same for you. Last edited by rathbaner; 10th-April-2019, 17:28. ROM was a seriously talented player. He broke that leg just as he was really making a big impression. Awful shame. Best of luck to him. Shi*e! Almost looked like he was knocking on the door of the Irish squad before he got injured. Definetly unlucky to have not played more with some of the strength we have on the wings. Didn’t think a leg break was really career ending anymore. Think he broke his fibula. Which is the strongest bone in the body. He would have been a valuable player to have during a World Cup year. Really shi*e news for the lad. Seemed a very honest lad. https://munsterrugby.ie/2019/04/10/r...ced-to-retire/ Munster Rugby can today confirm that Ronan O’Mahony will retire from professional rugby with immediate effect. Commenting on the announcement O’Mahony said, “I’m heartbroken to be finishing my career earlier that I had expected. The last two years have been pretty tough since initially breaking my leg, and ultimately the injury has made it impossible for me to continue. “I take great confidence in knowing the medical team and I have given everything to this and we have done everything possible in looking to regain full fitness. However, it’s a battle that I’m not going to win and as such I have been forced to call it a day. “Growing up in Limerick, it was a dream of mine to play for Munster and now to look back over my 20’s and realise what I’ve achieved I’m extremely grateful for every opportunity I had in the red jersey. 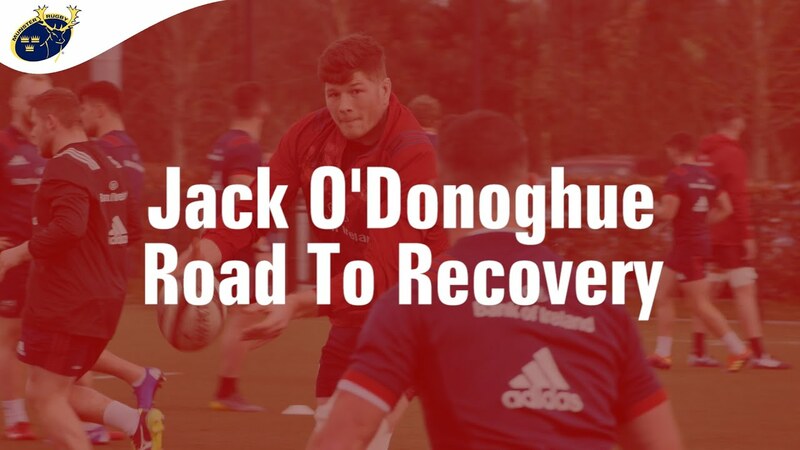 “I look back on it all with fantastic memories, from my early days of togging out in Garryowen, to my school days in Castletroy College, and finally the pathway all the way up through the Munster system. Running out at my home ground of Thomond Park, playing in front of family and friends, and representing the people of Munster has meant everything to me. “To everyone who has helped me along the way, my family and friends, girlfriend, coaches, teammates and supporters, I can’t thank you enough. Very tough for Ronan. Honest and exciting player and a fine finisher. He had a fantastic season in 2016/17 and could have finished outright top scorer in the league only for his bad leg break. He wore is Castletroy College socks that night against the Maori. Best of luck to him in the future. Peter O’Mahony, Keith Earls, Jean Kleyn and Conor Murray all picked up knocks and niggles in the win over Cardiff last night. Peter O'Mahony and JVG after last night's win. MUNSTER HEAD COACH Johann van Graan said he is planning to be without some of his first-choice internationals next weekend after a bruising encounter with Cardiff Blues ended in a bonus-point win at Musgrave Park. Peter O’Mahony, Conor Murray, Jean Kleyn and Keith Earls all picked up knocks of varying severity, and with an away trip to Italy to face Benetton next week, van Graan will hand time off to some of them. Earls didn’t start the game due to tight leg muscles in the warm-up, Kleyn scored a first-half try but limped off shortly after the restart, Murray also touched down after he had passed a first-half HIA, while O’Mahony was taken off just before the end following a blow to the shoulder. 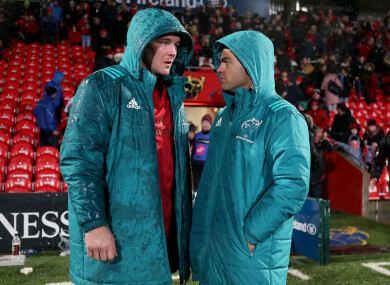 Munster finished the game with 14 players as a result of O’Mahony’s withdrawal, and when asked about his captain’s injury, van Graan was non-committal, even though it looked like a precautionary move with the win secured. “Yeah, look, it’s been a physical few weeks, a few knocks and bruises,” said van Graan. “Earlsy before the game pulled up with a few tight muscles in his leg so we decided not to risk anything. “So a few guys will get a well-earned break now. It was pretty important that we get the win, make sure we qualify for the Pro14 play-offs, make sure we qualify for Europe next season and beat a well-drilled side called Cardiff. “A few guys will have a breather. A few guys have played a few weeks in a row now so we’ll manage the squad. Certain guys will go away according to our Irish player welfare system, certain guys will go to HPC training. Last night’s win means Munster are guaranteed third spot in Conference A and will definitely play Champions Cup rugby next season. Top spot is still the priority though, and a bonus-point win was crucial with leaders Glasgow Warriors claiming five points against Ulster to maintain their three-point lead. “We’re very happy with that win, very happy with that bonus point as well,” Van Graan adds. “Cardiff is a very good team and we knew that this was going to be tough, especially on the back of the European quarter-final. “They had the extra week’s rest and we played them on a 4G which they’re used to, so obviously one or two things we can work on but to put 40 points on Cardiff on a Friday night, I’ll take any day of the week. Last edited by Crazyemerald; 6th-April-2019, 15:10. Short but good interview with TOD in the Indo today. Will be back next month and sounds positive and keen. Wants to have a go at RWC selection. Hope he comes back and blows the doors off! He was over in Edinburgh sitting the stands with the rest of us. And there last night in Cork. He really does deserve a few years injury free to allow him achieve his potential again.